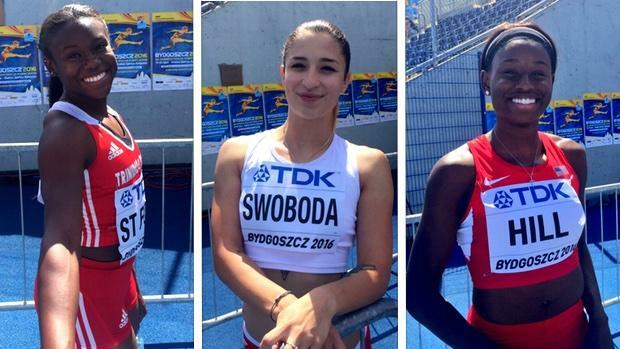 The junior women's 100m is shaping up to be the marquee event of the IAAF World U20 Championships in Bydgoszcz, Poland, this week, thanks to the star power generated by professional teenagers Candace Hill and Khalifa St. Fort and the youthful exuberance of hometown hero Ewa Swoboda. Rivals Hill and St. Fort entered the competition as favorites after placing first and second at last summer's IAAF World Youth Championships in Cali, Colombia. They have reprised their roles at the top of the descending order list, but this July sees them operating within a new pedigree as both athletes opted to turn pro during the high school season. Hill, a rising senior at Rockdale County High School in Georgia, became the youngest American track and field athlete to turn pro when she signed a 10-year contract with ASICS as a 16-year-old last fall. St. Fort, who lives in Florida, represents Trinidad and Tobago and trains with former T&T Olympian and current NBC track and field analyst Ato Boldon. She signed a contract with Caribbean-based Flow Communications this March, two months before her high school graduation. This morning's session at Zawisza Stadium in Bydgoszcz saw both stars win their prelim rounds: Hill in 11.43 (-0.8), St. Fort in 11.50 (-1.6). Both last competed at their respective countries' Olympic Team Trials, and they're carrying the subsequent high and low emotions. St. Fort, who anchored Trinidad and Tobago's bronze medal-winning 4x100m relay in the prelims at last summer's senior-level world championships, placed fourth in the 100m at her Trials to earn another relay berth in Rio. Despite her excitement to compete in her first Olympics, St. Fort says she is 100 percent zoned in on competing in Bydgoszcz this week. "Same focus [as Trials]," she said. "Come out here and do my best, execute my training well, make my coach proud, make my family proud. My goal this week is definitely to break 11." Her 11.16 from the Trinidad and Tobago Olympic Team Trials was a new PB and set a new national junior record. Hill, who broke the U.S. national high school record with her 100m PB of 10.98 last June, saw her Olympic dream end in the semifinals in Eugene, Oregon, two weeks ago. "I felt like I put an extreme amount of pressure on myself; more than I should have," she said of her Olympic Trials experience, "and I feel like that affected my performance." The 17-year-old placed 13th overall in the semifinal round of the 100m and 14th in the 200m semifinal. "The biggest lesson I learned [from Olympic Trials] was keep everything the same," she said. "Even though you made it this far, don't change your routine, change your repetition. Just do it like you have been. Another lesson is, you're 17. You don't have to compare yourself to others because you're a different age from them and even though you didn't get the results you wanted, just keep your head held high." Though Hill and St. Fort are running as well as ever, there's no guarantee the podium will look identical to that of last summer in Cali. Hometown hero Ewa Swoboda ran all the way through the line and her screech brought down the house when she saw her time on the clock: 11.10! The mark was aided by a tailwind of 2.7 meters per second, but the Poland native owns the world junior record for 60m at 7.07 and is building momentum. "It's the best situation to run in front of a home crowd," she said through a translator after her race. "It makes me want to run faster." Another star on the rise is Imani-Lara Lansiquot of Great Britain, who broke 11.20 for the first time with a lifetime PB of 11.17 (+1.7) to win her prelim. Stay tuned for full interview videos from the mixed zone.